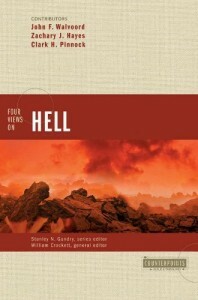 The definition of hell promises to be one of the burning issues of this decade. Is hell literal with real fire and torment lasting forever? So says John Walvoord. Holding this position myself, I hoped for a lengthier treatment. His rebuttals are better than his presentation. The editor presents the metaphorical view that hell is real and lasts forever but the language about physical pain and suffering are not to be taken literally. He quotes many well-known advocates of this view such as Billy Graham, Carl Henry, Donald Carson, Donald Guthrie, J.I. Packer. A Catholic Theologian, Zachary Hayes, presents the Catholic view of Purgatory. Why? I don’t know! (although it is a form of universalism). Clark Pinnock presents the conditional view that hell is real and hot but the lost are annihilated upon entering and cease to exist. Three of these views are important to know about and the fourth is interesting.